The Government made the announcement today, ahead of the State Election on Saturday, November 24. A re-elected Andrews Labor Government will deliver an $11.8 million funding boost for Ballarat’s Eureka Sports Precinct, with more than half of that dedicated to improving amenities at Mars Stadium. Additional accessible seating in the Western and Eastern stands. Upgraded entrances with new ticket boxes. Covered areas to make it easier and more comfortable for fans to enter the ground. Permanent bathrooms to replace temporary toilets on match days. Permanent food and beverage areas. 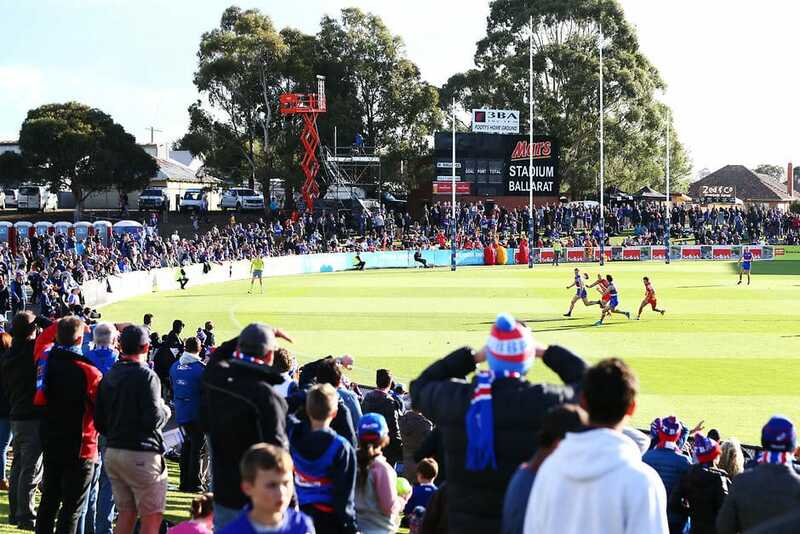 The Western Bulldogs, the Andrews Government and the City of Ballarat have enjoyed a strong partnership over the last three years, which has seen AFL played in the region for the first time. The Bulldogs have hosted three AFL games for premiership points at the venue, as well as played in JLT Community Series games and AFLW practice matches. The Club has also conducted its AFL Community Camps in the region in recent years, and delivered a suite of programs focused on schools, men’s and women’s health and youth leadership. “Today’s announcement is an indication of the Andrews Government’s commitment to enhancing the game-day experience at Mars Stadium and supporting sport in the region,” said Bulldogs’ President Peter Gordon. “The Club has made a long-term commitment to building its footprint in the west of Victoria, including Ballarat. “Each time we’ve played there we’ve learned something new. The last game was the first in which we struck really inclement conditions, and I promised our members that we would respond to ensure that the game-day experience would be better in future games, come rail, hail or shine. The Andrews Government initially provided more than $38.5 million to upgrade the Mars Stadium Precinct, including $15 million to bring the stadium up to a standard to host AFL matches. Earlier this year it also invested a further $500,000 to start planning for the second stage of the Mars Stadium redevelopment. “We’re investing in the future of Mars Stadium to bring more footy, more visitors and more jobs to Ballarat,” said Premier Daniel Andrews.